ON THIS DATE (April 22, 2007) ... In the 107th year of the team’s existence and the 96th in Fenway Park, a crowd of 36,905 saw something no Red Sox patrons ever had seen. In the third inning of tonight’s 7-6 conquest of That Team From New York the Red Sox went back-to-back-to-back-to-back. The Red Sox were trailing the Yankees and rookie lefthander Chase Wright, 3-0. 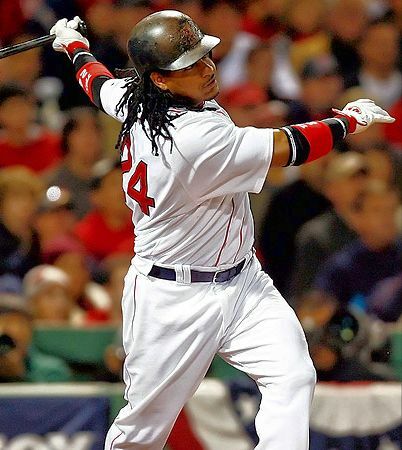 There were two away and nobody on when Manny Ramirez stepped to the plate. Manny had not exactly been tearing the ol’ cover off the ball. But he saw a 2-1 pitch to his liking and he sent it far over the wall in left-center, the ball landing a row or so in front of the Volvo sign. It was his second of the season and the 477th of his career. 3-1, Yankees. J.D. Drew was up next. He had struck out in the first, leaving two men on. The count went to 1-2. Drew launched the next pitch over the Red Sox building, landing just in front of the Nikon sign. It was his second of the season, his first in Fenway, and the 162nd of his career. 3-2, Yankees. Mike Lowell was up next. He had struck out leading off the second. The count went to 1-1. Lowell cranked the next pitch high and deep to left, as in “Hello, Lansdowne Street.” It was his second of the season and the 165th of his career. Game tied at 3. The Red Sox had just hit three consecutive home runs for a combined total of, oh, seven million feet. Well, maybe not. But it was well over 1,200. Jason Varitek was up next. The captain, who had come into the game with a perked-up bat (5 for 8 in his past two games, including the tying home run Friday night), had flied to right in the second. The count never went to anything. 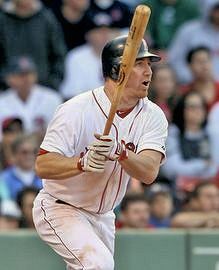 Varitek attacked Wright’s first pitch and sent a screamer to left, the ball comfortably clearing the wall. Sox lead, 4-3. The lucky 36,905 had just become only the fifth such-privileged group in major league history. For only the fifth time, a team had gone back-to-back-to-back-to-back, and this was only the second time against the same pitcher. The other four teams to hit four consecutive home runs were the 1961 Braves (Eddie Mathews, Hank Aaron, Joe Adcock, and Frank Thomas); the 1963 Indians (Woodie Held, Pedro Ramos, Tito Francona - yes, The Skipper’s dad - and Larry Brown); the 1964 Twins (Tony Oliva, Bob Allison, Jimmie Hall and Harmon Killebrew); and last year’s Dodgers (Jeff Kent, J.D. Drew, Russell Martin, and Marlon Anderson). That’s some weird stuff. The Braves’ quartet were all bangers. Messrs. Mathews, Aaron, Adcock, and Thomas combined for a career total of 1,889 homers. Now in case you’re wondering how Frank Thomas could have been playing for the 1961 Braves, no, it’s not the Big Hurt. The first Frank Thomas was a slugger of some repute for such teams as the Pirates, Phillies, and even the Original Mets. He had 286 career homers. The Twins’ quartet were bangers, as well. That group combined for a career total of 1,172 homers. Jimmie Hall is somewhat forgotten now, but he hit as many as 33 in a season. Those with acute memories might recall that he hit two homers in a losing effort the night Tony C. was hit. As for the Dodgers, yup, that’s our own J.D. Drew. This was the amazing game in which the Dodgers hit those back-to-back-to-back-to-backers in the ninth inning to get the game into extra innings. The first two were off Jon Adkins, and the last two were off renowned closer Trevor Hoffman. Three of these came on consecutive pitches. Oh, and Nomar Garciaparra won the game in the bottom of the 10th with a two-run homer. But take a look at the other list. Those four 1963 Indians combined for a career total of 35 home runs during that entire season. Pedro Ramos was a pitcher, for God’s sake. This means the men hitting the back-to-back-to-back homers were the numbers 8, 9, 1, and 2 in the order. And, no, that’s not the Larry Brown you’re probably thinking of, either. That Larry Brown was a light-hitting shortstop who had a career total of 47 homers, or only 32 more than Ramos. The victim of all four homers was right-hander Paul Foytack. Lowell’s evening was only beginning. He came up in the seventh with his team trailing by a run and two on and lined another homer, this one a hard liner that barely carried the wall, Lowell’s professional estimate being an eight-inch clearance. It was the winning homer. Somewhere in that crowd had to be someone attending his or her first major league game. Let’s hope someone was able to explain to that person just exactly what he or she just saw. Because he or she isn’t going to see that again.